Come away from the thorn and thistle infested wilderness and rest awhile. There have been times when the LORD has prompted me to keep my thoughts to myself and allow the Holy Spirit the freedom to speak to you directly, this morning is one of those times. “My response is to get down on my knees before the Father, this magnificent Father who parcels out all heaven and earth. I ask him to strengthen you by his Spirit—not a brute strength but a glorious inner strength—that Christ will live in you as you open the door and invite him in. 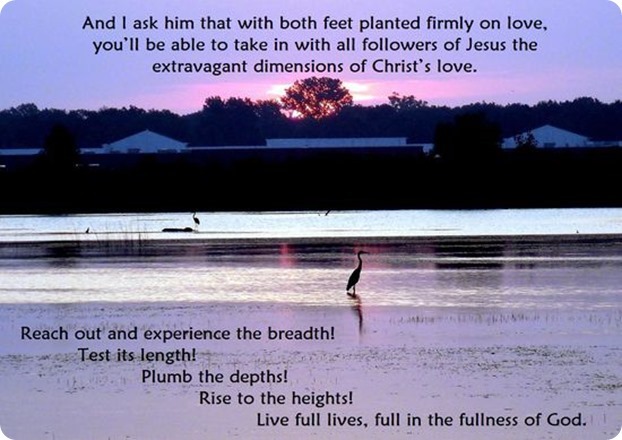 And I ask him that with both feet planted firmly on love, you’ll be able to take in with all followers of Jesus the extravagant dimensions of Christ’s love. Reach out and experience the breadth! Plumb the depths! Rise to the heights! Live full lives, full in the fullness of God. Believe! Anticipate! Experience! Be transformed! Note: Should you want to go back and review this Glory Seed or if you’d like to subscribe so you can receive them in your email you can do so by clicking on this link: https://gloryseeds.wordpress.com/. This entry was posted in Uncategorized by Crusty the Christian. Bookmark the permalink.